Conversion of Saul (undergoing restoration), Michelangelo ca. 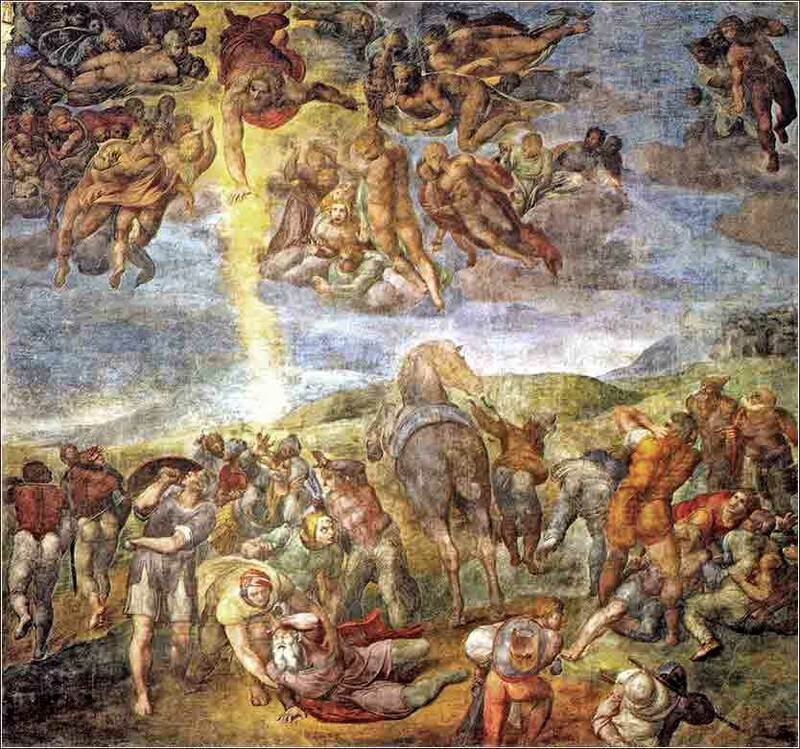 1545, fresco at the Vatican. The original is huge: over 20 feet high and wide. Sing to Jesus. Sing to Jesus. Fall on Jesus. Fall on Jesus. 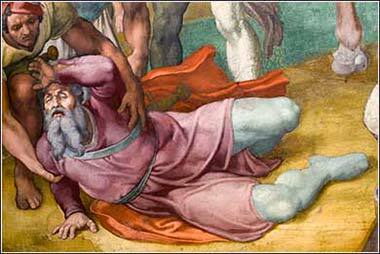 The Conversion of Saul (detail), Michelangelo ca. 1545.
more like a curse than a blessing. The man named Saul in this passage was a Jew from the tribe of Benjamin (the same small tribe which gave King Saul to the Jews 800 years earlier), who lived in south-central Turkey in the town of Tarsus. He was a Roman citizen. At the time of this passage, he was part of the violent arm of the Pharisees who actively sought out and persecuted followers of Christ. He was, as the verse tells us, eager to kill them. He had official papers addressed to the synagogues in Damascus, in effect an open arrest warrant; so his mission was to go there, find out who was worshipping Christ, put them under arrest, and take them to Jerusalem in chains. There they would be tried and, presumably, executed if found guilty. Religious violence has plagued the world for a long time, no doubt since times before it could be recorded by the written word. Without lessening the horror of the Nazi genocide against Jews under Hitler, it is ironic that the first reaction of the Jews to the new Christian sect was an attempt to exterminate them. But Saul of Tarsus did not reach Damascus as he had expected, full of vinegar and ready to round up Christians. Instead, he arrived blind and shaken to his core, so traumatized that he could not eat or drink. Many of us feel callings to serve Christ in our lives. We hear a soft voice, have a feeling, or simply feel led in a certain direction. But Paul needed, should we say, a firmer hand. If we get a tap on the shoulder, he got a divine left hook to the jaw. Of all the people in the Bible whom God chose, despite their reluctance to serve, no other got the almost comical coercion that we see inflicted on Paul. Moses had to be talked into his role, and Jonah, tossed off a ship at sea and swallowed by a great fish. But Paul takes the cake. He is the enemy of Christ, and Christ shows him “who's the boss”. So, Paul is the red-headed stepchild (and in fact, he is often depicted with red hair); but nevertheless, he can give first-hand witness to Christ's resurrection even though, unlike James, he did not see Jesus in the flesh.